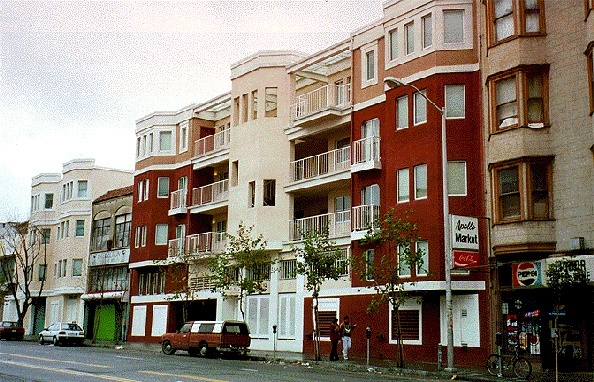 The Plaza del Sol apartment complex on Valencia between 15th and 16th Streets, built by the non-profit Mission Housing Development Corporation in the 1990s. From 1960 to the mid-1990’s, over 68,000 residential units were built in San Francisco. Over the same time period however, rents went up considerably and the number of rental units available in the city fell. This was partially due to private developers’ preference for condominium conversion over building new rental units. In this piece Calvin Welch documents the steps neighborhood groups took to advocate for affordable housing, including organizing and forming their own nonprofit development groups. A three decade battle has raged over the preservation of housing in San Francisco. Land use policy has been at the very heart of San Francisco's politics since the official adoption of massive urban renewal projects in the mid-1960s. To put it simply, a three-decade fight has been waged between neighborhoods, mainly in the eastern portion of San Francisco, and developers seeking to transform those neighborhoods by displacement, conversion and demolition. At times the battle has been waged in the "public sector," pitting publicly funded "redevelopment" against these neighborhoods and at other times in the private sector as commercial office developers and the urban "gentry" sought the same ends by less obvious through equally destructive means. San Francisco's compact 49 square miles are all developed, there is little "free land" left to develop. That means that new commercial uses or new housing for a new "market" necessarily means the displacement and demolition of existing residents and neighborhoods. The bottom line is that the supply of affordable housing--single family homes, duplexes and small apartments in the Western Addition, Hayes Valley and Mission, small apartments and residential hotels in Chinatown, the Tenderloin, South of Market and the North Mission--took severe losses in this battle. Defending those neighborhoods--first the housing and then the small businesses and community facilities so necessary for humane urban life--fell upon neighborhood-based activists, as the City, during much of this period, was either the direct instrument of "renewal," or later, as national policy changed, a "partner" of private sector actors seeking the same ends. Through trial and error, neighborhood groups became "expert" in urban planning issues. First through lawsuits, then using planning and zoning controls, then using the political process with initiatives and ballot measures and finally through the development of community based non-profit development corporations the neighborhood response during this 30 year battle went from the defensive to the offensive--from stopping bad things from happening to making good things happen. The first shots fired in the battle to save affordable housing and the neighborhoods they served was over the issue of demolition of "sound housing." The chart below lays out the thirty year record of residential demolition in San Francisco (but does not include residential hotel rooms). The obvious downward trend shows the withdrawal of the public sector, with its massive use of public funds, as the primary demolisher of the City's housing stock. The "spike" in 1989-1990 was due to the earthquake. From 1967 to 1979--the very height of urban renewal--some 7,000 dwelling units were demolished in San Francisco. 59% (4,300 units) of them were demolished as a result of public action. The majority of these units were rental apartments in buildings of 5 units or more. In addition to these apartments, between 1970 and 1979 public action resulted in the demolition of some 4,000 residential hotel rooms (private action resulted in another 1,300 residential hotel rooms being demolished during this period). The overwhelming majority of these demolished units were affordable housing for both singles and families, and were centered in the Western Addition and the South of Market redevelopment areas. But starting in 1980, public demolition was overtaken by private demolition. Between 1980 and 1995, a total of 2,326 units were demolished; 86% by the private market (2,000 units). In addition, 657 residential hotel rooms were destroyed during this period, all by private action. This private demolition centered on single family homes and duplexes, with just about half (1,033 units) of the total being in these two building types. These demolitions centered on the Richmond, Parkside and Sunset neighborhoods. The key fact to keep in mind when addressing residential demolition is that the newly built units are always less affordable than the ones demolished. Moreover, private demolition usually precedes new development at greater densities than that which was demolished, affecting "neighborhood character." According to the Department of City Planning, a whopping 68,000 residential units have been built in San Francisco since 1960. While these figures, reported annually in the DCP's publication Changes in the Housing Inventory since 1966, may well overstate production (especially for the figures during the 1960s) due to interdepartmental inconsistencies in data collection, shifting definitions, and poor record keeping, they nonetheless indicate correctly that there has been over the last thirty years an extraordinary amount of residential construction in San Francisco. The often heard complaint that San Francisco is too difficult to build in, that its planning and building codes are too restrictive and that its residents are particularly opposed to residential development is simply not born out by the facts. Neighborhood opposition to residential construction is generally centered on specific issues of community concern--density and neighborhood character, demolitions and the preservation of historic buildings, and affordability--not some generalized opposition to all housing construction. Using more recent figures we can take a look at the types of residential construction that has occurred over the last twenty years. The most obvious conclusions to be drawn from the above chart is the growing dominance of the large multi-unit building as the primary residential building type in San Francisco. These building have made up an increasing majority of the new housing built in San Francisco. Indeed, the DCP had to create a new data category in the mid-1970s--"building of over 20 units"--to keep statistical pace with the dominance of this building type. At the other end of the spectrum, the construction of single family homes has declined by 50% over the last twenty years. The result of this trend can be seen in the chart: San Francisco's Housing 1975-1995. One of the most glaring aspects of San Francisco's current housing crisis has been the steep decline in the number of vacant units available for rent. The obvious question from the above figures is how, if some 24,000 units in multi-unit buildings have been constructed in the last twenty years, can there be a shortage in the "supply" of rental units?
. "..new condominium recordation by the Department of Public Work's Condominium Subdivision Office. Annual totals in condominium recordation do not directly correlate with annual units completed because recordation in any given year may be for projects not yet completed or for projects completed in a previous year. The data indicate a consistent trend in condominium construction. New condominium activity peaked in 1991 and 1992 and decreased since then." Changes, 1995, p19. From 1980 to 1995, DCP figures indicate that some 18,000 units were built in buildings of 3 units or more. Yet, it appears that more than half of them, 10,000 or so, were new condominiums, not apartments. It is interesting to note that during the same 15 year period, church and community based non-profit housing developers produced about 7,000 new housing units, the vast majority of which were rental units. Could it be that the private, for-profit housing development sector has simply quit building rental housing in favor of the more profitable condominium? HISTORIC PERSPECTIVE: Condo conversions began to occur in significant numbers in the late 1970s. In the early 1980s they were averaging some 600 units a year (2,332 conversions from 1980-83, inclusive). In 1983, after years of lobbying by tenant and neighborhood groups, an ordinance was passed limiting the conversion of rental units to no more than 200 units a year. Condo conversions reduce the number of rental units, usually in small buildings (for example, in 1995, 77% of the conversions that year were in buildings of 2 to 4 units). These 5,000 conversions of existing apartments, when added to the 10,000 new condos, start explaining why there is a shortage of rental units, with the resultant push on higher rents. First, the roots of San Francisco's current housing affordability crisis go back nearly three decades when public and private action demolished some 7,000 residences and 5,300 residential hotel rooms between 1967 and 1979. The overwhelming majority of these units were affordable to lower and fixed income San Franciscans. Second, the destruction of these homes were stoutly opposed by neighborhood and community groups. Over time these groups went from opposition to advocacy, from demonstrations to skill in non-profit affordable housing development. Third, San Francisco reputation of being "anti-development" is grossly overstated in reference to residential construction. Nearly 30,000 new housing units have been constructed over the last twenty years. If it were possible to simply "build" our way out of a shortage of affordable housing we would have done so by now. Clearly, something other than simple "supply and demand" is at work in San Francisco's housing market. One such factor is the overwhelming popularity with for-profit housing developers of the "condominium" type housing unit, both in new construction and conversions. Figures indicate that church and community based non-profit developers may be the only housing developers producing new rental housing in San Francisco.